This powerful garden shear is one of those tools which are a must have for all the gardening enthusiasts. Make Your Garden Pruner Experience far More Comfortable, Easier, Less Painful, Much More Enjoyable.The precision and strength of this amazing accessory is unmatchable and it is guaranteed to serve you for the Lifetime. - HEAVY DUTY TITANIUM CLASSIC STYLE BYPASS PRUNING SHEARS: Increased Blade Durability & Razor Sharp Cutting Power Performance. Made of High Quality Japanese Grade Stainless Steel - More Durable Than Other Similar Traditional Hand Pruners - Protective Titanium coating decreases friction of trimmer for easier cutting & offers long-lasting protection against rust & corrosion. - ERGONOMICALLY ENGINEERED ANTI-SLIP RED CUSHIONED LONG HANDLE GRIP HAND PRUNERS WITH SHOCK ABSORBING PADS: Strong & Lightweight Drop Forged All Metal Aluminum Body & Handle Secateurs - Pruning Shear Fit Medium to Large Hands & Help Reduce Repetitive Hand Motion Injuries, Hand Fatigue & Wrist Strain - Ideal Versatile Gardening Trimmers for General Yard, Farm Work & Multi-Purpose Intensive Pruning, Arthritis Sufferers, Carpal Tunnel & Seniors with Weak Hands. - Sap Grooves Prevents the Pruning Cutters From Sticking And Saves Time By Channeling Off Sap To Keep The Bypass Blade Clean Of Debris After Each Cut - Wire Cutting Notch Is Incorporated Into The Clippers To Expedite Planting And To Protect The Cutting Edge Of The Snips. - MICROMETRIC ADJUSTABLE SYSTEM Allows Manual Adjustment And Alignment & Play of The Cutting Blade For Optimal & Precise Clean Cuts Every Time of the Scissors - Smooth & Effortless Cutting Actions Make Trimming An Easy Chore of Rose Stem, Floral Plant, Shaping Ornamental Flowers, Vines, Grape, Fruit, Tree Limb, Branch, Shrub, Bush Hedge, Lawn, Edging & Small Trees Without Much Effort. Will Cut Through 1/2', 3/4' & 1 inch Diameter Size Branches Depending On The Wood Species. 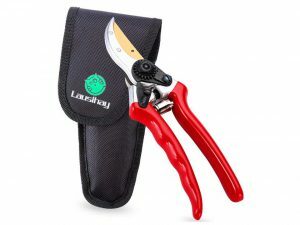 - GREAT PRESENT FOR GARDENERS: This is a heavy, high quality Pruning Shears you'll be proud to give. IT has a thick Good-Looking Holster and is packaged in a gift box and feels expensive. It is suitable for any landscapers arborists and growers,Every gardener needs this Pruning Shears!